Speak to people in the Temple to find out their true feelings about King Helseth. Speak with Tienius Delitian in the Royal Palace Throne Room and agree to help him find out what the Temple thinks of King Helseth. Speak with Galsa Andrano in the Infirmary about discontent in the Temple. Return to Tienius with the information. Speak with Tienius Delitian in the Royal Palace Throne Room again and agree to help him further. This time he will ask you to find out what the Temple thinks of the new King Helseth. Specifically, Tienius wants to know whether they accept him as the new King or if the Temple is planning to act against him. Go pay a visit to the temple and ask people about discontent in the Temple. Almost everyone will give you the same, stock answer. Head over to the temple Infirmary in the hall to the right as you enter the Temple and speak to Galsa Andrano. Mention Mehra Milo and the Dissident Priests, and she should be able to speak freely. She expresses definite dislike of Helseth and says that the Temple and Almalexia will attempt to force him out (you receive a journal entry to this effect). Galsa also expresses a certain fear of Almalexia. Return to Tienius with the information you gathered from Galsa Andrano. 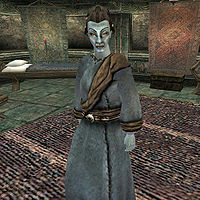 If you have not progressed far enough in Morrowind Main Quest to be acquainted to Mehra Milo then you will have to boost Galsa Andrano's disposition to above 90 and talk about discontent in the Temple and Ask about the Temple and King Helseth. 1 Tienius Delitian, Helseth's Captain of the Guards, says there are rumors of discontent in the Temple. He wants me to go to Almalexia's Temple, look for someone discontented, listen sympathetically, and find out whether the Temple is willing to accept King Helseth -- or whether the Temple plans to act against him. 50 Galsa Andrano, a healer at Almalexia's Temple, is the sort of Temple informant Tienius Delitian is looking for. She says that if Helseth seeks in earnest to be king, then Almalexia and the Temple are sworn to destroy him. 100 Finishes quest I told Tienius Delitian that I spoke with Galsa Andrano, a healer at Almalexia's Temple. From her I learned that Almalexia and the Temple are sworn to destroy King Helseth if he seeks in earnest to be king. Tienius Delitian seemed well-satisfied with my handling of the matter.